A discussion draft of the 21st Century Transportation Fuels Act was released on Nov. 21. The bill aims to sunset the RFS and enact a national octane specification. Those in the biofuels industry are criticizing the bill for its treatment of the RFS. Sen. Chuck Grassley, R-Iowa, has spoken out regarding a Nov. 20 Reuters report indicating the U.S. EPA plans to issue a rulemaking in January to “reset” the Renewable Fuel Standard targets, noting the action could further weaken the RFS. DuPont’s 30 MMgy cellulosic ethanol plant in Nevada, Iowa, is now under new ownership. Verbio North America Corp. completed its purchase of the plant on Nov. 20 and will soon move forward with plans to convert the facility to produce RNG. UNICA, the Brazilian sugarcane industry association, has announced that domestic sales of hydrous ethanol set a new record during the second half of October, reaching 1.07 billion liters (282.66 million gallons). The UAI has announced the release of its “Beyond a Reasonable Doubt” research series, which digs into the history, science and the public policy behind how we fuel our vehicles and aims to help readers understand why the use of ethanol is limited. The U.S. Department of Energy has announced it is awarding $98 million to support 40 transformative energy technology projects under ARPA-E's latest open funding opportunity. Biofuel-related projects are among those to receive funding. Nearly 50 million travelers will take to America’s roads this Thanksgiving holiday, and ethanol is helping to lower the price they pay for gasoline. A new survey also shows the cost of Thanksgiving dinner is expected to hit an eight-year low. Invest Nebraska has invested in White Dog Labs, a business focused on producing feed for the aquaculture industry. The company's first production plant will be co-located with Midwest Renewable Energy's ethanol plant. 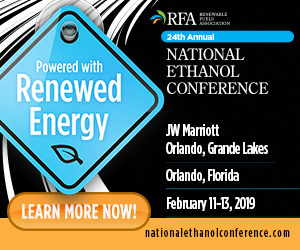 There has been a media blitz lately by the oil industry saying that ethanol demand has been unaffected by the U.S. EPA’s rampant grants of RFS exemptions to small refineries. Don't be fooled by these claims, according to the RFA.